This year’s unofficial University of Waterloo tour coincided with UW’s own Open House event, and took place on Tuesday, March 11th. Which just happened to be on the same date as the last year’s tour. This was my 3rd year organizing and hosting such campus orientations, and it was the best yet. More people came out this year, though that also meant that it was harder to get a hold of everybody. It didn’t help that I was meeting most of the group, in person, for the first time. The planning stage was rushed, and I know that some people weren’t able to make it out due to conflicting plans. Sorry guys. The theme for this year was “standing around in a circle”. We stood around in the Student Life Center, waiting for everybody to show up. We stood around in the DC Library waiting for late people to show up. And there was more standing around at various locations on campus, for a variety of reasons. Though we did manage to cover the Math/CS part of the campus, as well as a couple of residences. 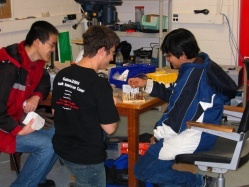 There was also a side-quest through the Robotics Club of Waterloo’s Engineering. There A.J. has managed to sneak in a game of speed-chess, for no apparent reason. And as a tradition, now 3 years in the making, we finished with a round of wings at the Molly Blooms pub, on campus plaza. What I find the best about such tours, is that they are very social events, not scripted “sell this University to students” guides. Over food, the entire group discusses the tour, the impressions of campus, the quirks specific to this University, but also why we still stick around. It’s a good mix of prospective high school students with University undergrads that generate a compelling discussion. For combo points, everybody was also a compsci.ca member, so it was an excellent chance to meet and get to know the people in the community. Besides the Waterloo’s campus, we also got to discuss the Canadian Computing Competition, DWITE, obviously Computer Science and Programming, but also the structure of the Universe and the elective courses one can take to understand it all better. It’s been great fun. 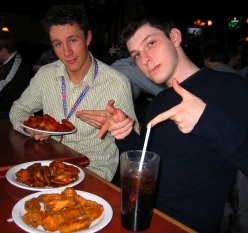 I’ll be putting together another University of Waterloo campus tour in March 2009, let me know if you are interested in joining us for some wings! @Mackie — remind me to start planning earlier in advance! I’ll see you at uWaterloo next year! Sounds like an awesome event, kudos for organizing it Tony. You’ve probably just attracted some awesome talent to the university! Next year if you are coming everyone needs to post a picture of themselves, just so we know who to look for (and give us your cell number if you have one). This is definitely better than the official tour since it gives us more insight as to what to expect in university, and what student life is actually like. Or we could all where ridiculous hats. That way we would know. I call the plush crown! Or we could do both! The SE kids got a kick out of that. 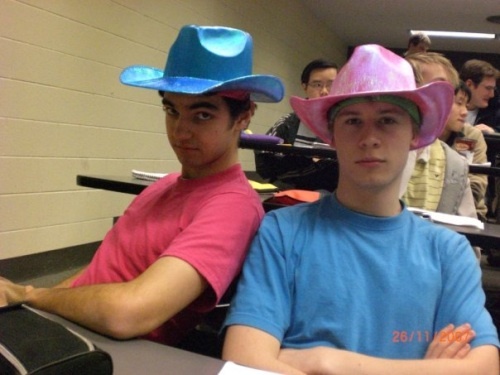 Too bad the digital circuits lecture I sat through in that attire wasn’t interesting. Heh. Thx for that demonstration Cervantes. I was going to put something up, but you beat me to it! Hope you’ll get to come out next year (I’ll try to get this venue announced in advance), and we should definitely do funny hats now. Thanks for putting this on, Tony. @AJ – C’mon, it was like $3.40 for 10 wings.